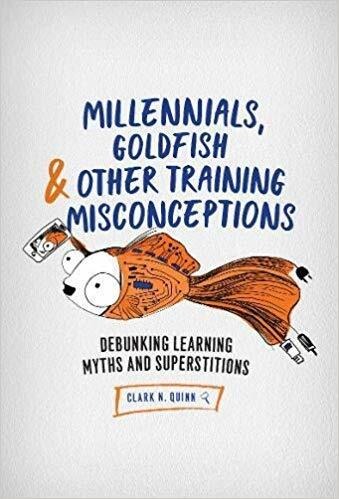 On the call were Maurice Coleman, Clark Quinn, and Paul Signorelli, for a discussion centered on Clark’s wonderfully stimulating new book (from ATD Press) Millennials, Goldfish & Other Training Misconceptions: Debunking Learning Myths and Superstitions. Clark talked about the process of writing the book at the request of ATD Senior Community of Practice Manager Justin Brusino (and why Clark originally wanted to call the book Dr. Quinn’s Emporium of Learning Myths); described what he learned from researching and writing the book (including what we actually know about the attention span of goldfish); offered insights into a variety of the learning myths and superstitions he explored in an attempt to help us better serve those we assist through our training-teaching-learning-doing efforts; and kept us entertained and interested in applying what we are learning from his work. The resources mentioned during the program were rich and varied, and have been documented in a separate post on this T is for Training site. « T is for Training 229 : Mr. Bubbly Pants!